Modern and slick! 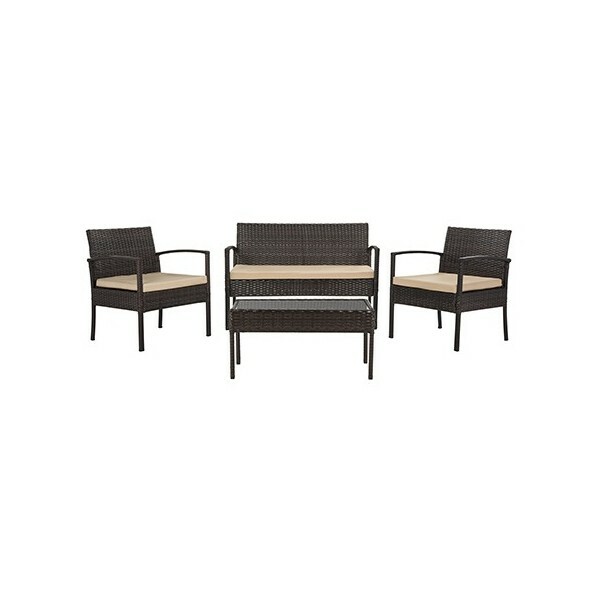 This brown beige rattan living set is a perfect fit for a new-fashioned lifestyle! 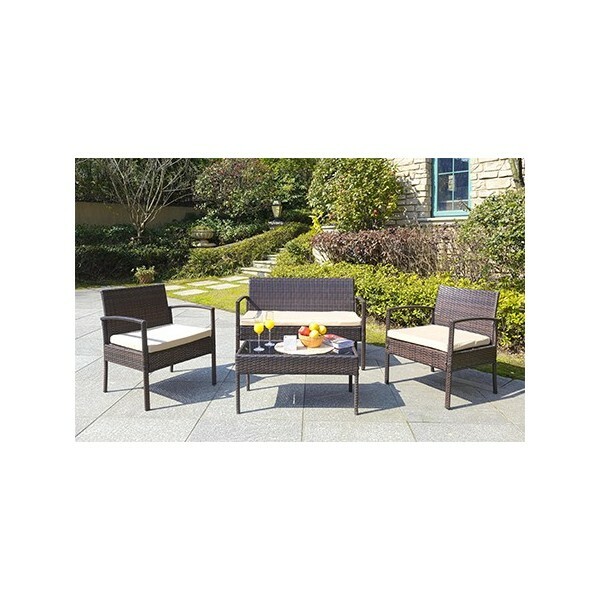 Whether it’s an evening under the stars or an afternoon filled with family, friends and food, this stylish four-piece living set is the foundation for outdoor entertaining. 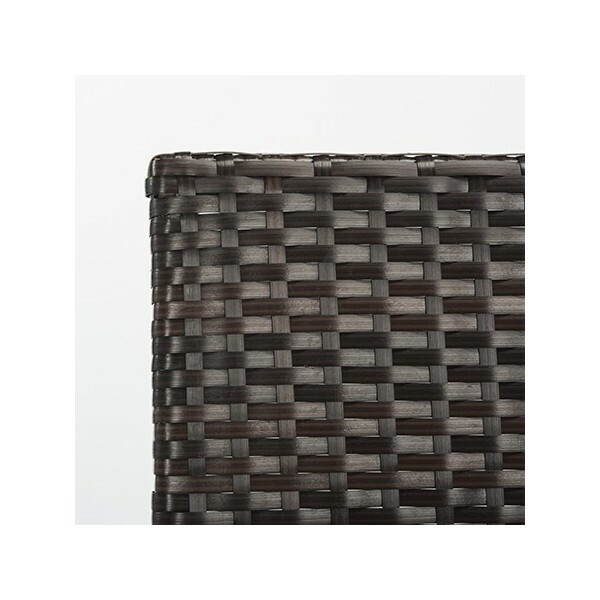 Crafted with durable rattan and steel, its beige hue complements any décor. Seat Dimensions (W * D * H): 20" X 18.7" X 15.40"
Bench: 42.5" X 23.6" X 28"
Chair: 23" X 23.6" X 28"
Table: 29.5" X 16" X 15"
Since 1914 Safavieh has been on the cutting edge of modern furniture designs. In 1978 they began operations in the United States. They continue rolling out award winning collections year after year and we are happy to partner with them to bring you the absolute best in quality furniture selections. 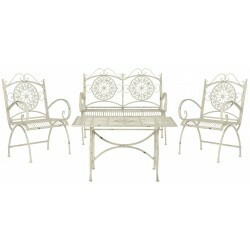 As shabby-chic as a flea market find, but fresh and new, this four-piece antique white outdoor set adds a romantic look to a porch or patio. Crafted of sturdy painted iron, this filigreed set includes a love seat, two chairs and slat-top coffee table. As shabby-chic as a flea market find, but fresh and new, this four-piece rustic brown outdoor set adds a romantic look to a porch or patio. 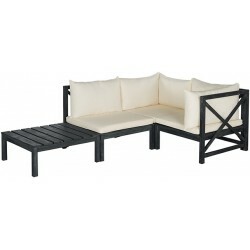 Crafted of sturdy painted iron, this filigreed set includes a love seat, two chairs and slat-top coffee table. 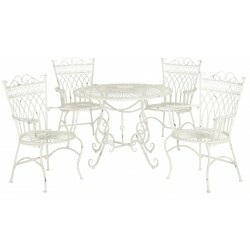 Gracious dining begins with this charming Victorian-style five piece outdoor set in chippy antique-white iron for a vintage look. 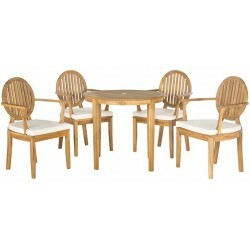 Whether you dine on the lawn or veranda, this table and chair set is styled to make every meal a touch more romantic. 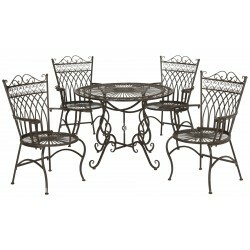 Gracious dining begins with this charming Victorian-style five piece outdoor set in rustic brown painted iron for an arts and crafts vintage look. Whether you dine on the lawn or veranda, this table and chair set makes every meal a touch more romantic. 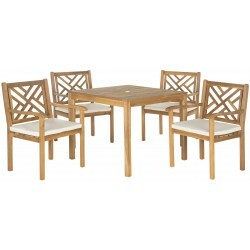 The ultimate expression of contemporary style, the Chino 5-piece dining set features acacia wood frames in teak brown and seat cushions covered in beige all-weather Textilene fabric. Round-back slatted chairs echo the coordinating table design. 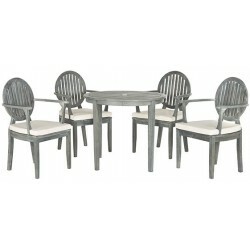 The ultimate expression of contemporary style, the Chino 5-piece dining set features acacia wood frames in ash grey and seat cushions covered in beige all-weather Textilene fabric. Round-back slatted chairs echo the coordinating table design. 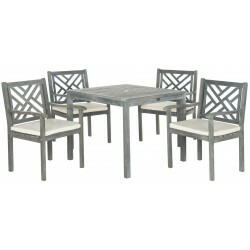 The ultimate expression of contemporary style, the Chino 5-piece dining set features acacia wood frames in dark slate grey and seat cushions covered in beige all-weather Textilene fabric. 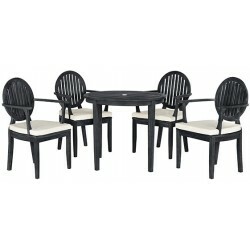 Round-back slatted chairs echo the coordinating table design. 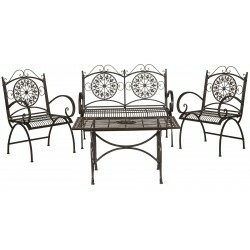 An English garden furniture classic inspired the Bradbury 4-piece outdoor living set with crosshatch seat back detail. Sustainable acacia in a teak finish is used for a coffee table and seating with seat and back cushions of beige all-weather fabric. A striking concentric square design with X detail adorns the chairs of the 4-piece Del Mar outdoor living set. Masterfully crafted of sustainable acacia wood in ash grey finish, this sturdy furniture comes with beige all weather-seat and back cushions. 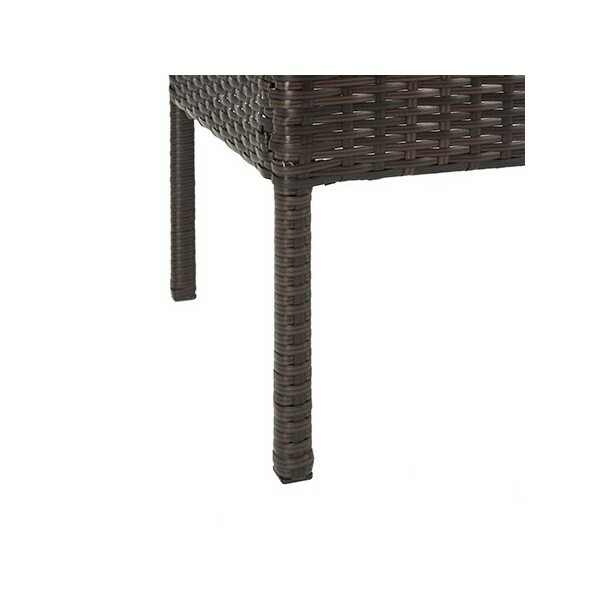 An English garden furniture classic inspired the Bradbury 4-piece outdoor living set with crosshatch seat back detail. Sustainable acacia wood in ash grey is used for a coffee table and seating with seat and back cushions of beige all-weather fabric. An English garden furniture classic inspired the Bradbury 4-piece outdoor living set with crosshatch seat back detail. Sustainable acacia wood in dark slate grey is used for a coffee table and seating with seat and back cushions of beige all-weather fabric. Exuding British Colonial style, the Fresno 4-piece outdoor living set features back detailing and coffee table top inspired by plantation shutters. The slatted design is crafted of teak brown acacia wood with contrasting beige all-weather cushions. Exuding British Colonial style, the Fresno 4-piece outdoor living set features back detailing and coffee table top inspired by plantation shutters. 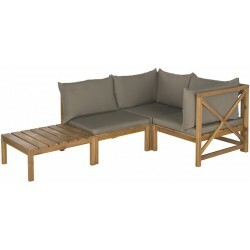 The slatted design is crafted of ash grey acacia wood with contrasting beige all-weather cushions. Exuding British Colonial style, the Fresno 4-piece outdoor living set features back detailing and coffee table top inspired by plantation shutters. The slatted design is crafted of dark slate grey acacia wood with contrasting beige all-weather cushions. 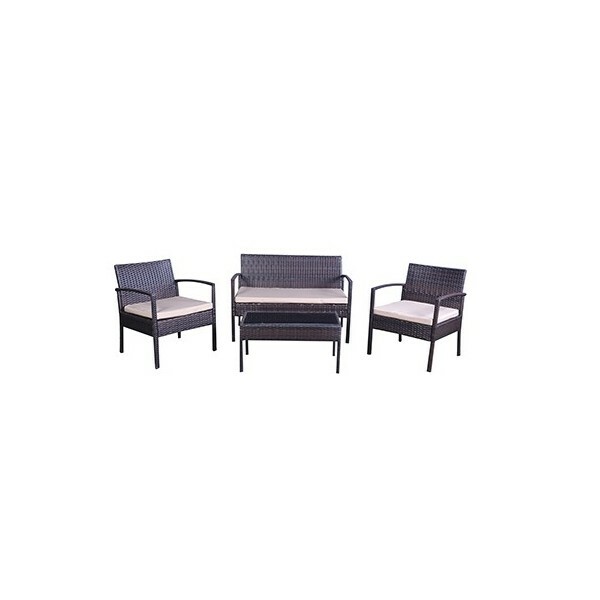 A contemporary update of classic British garden furniture, circle insets distinguish the slatted seat backs of the Montclair 4-piece outdoor living set. 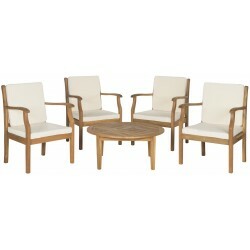 Crafted of sustainable acacia wood in teak brown, the set features beige all-weather cushions. 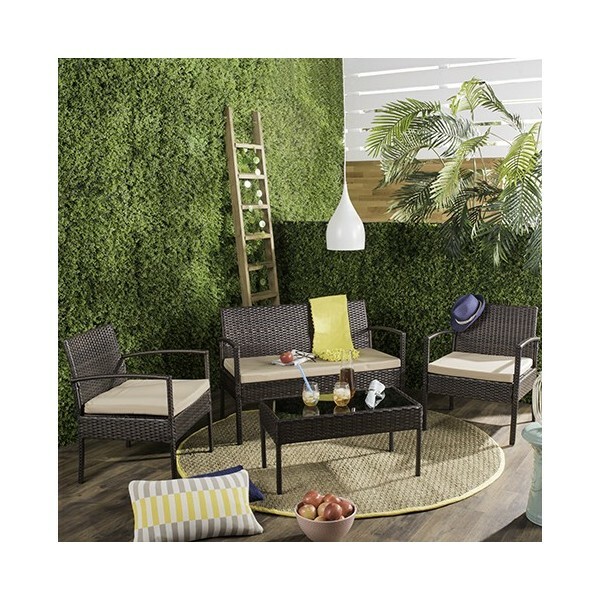 A contemporary update of classic British garden furniture, circle insets distinguish the slatted seat backs of the Montclair 4-piece outdoor living set. Crafted of sustainable acacia wood in ash grey, the set features beige all-weather cushions. Ingeniously designed and fashion-forward, the Lynwood Modular outdoor sectional may be configured to suit your space and mood. With two corner pieces, an armless seat and slatted coffee table that doubles as an end table, the look is chic and comfortable. 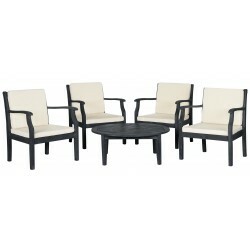 A striking concentric square design with X detail adorns the chairs of the 4-piece Del Mar outdoor living set. Masterfully crafted of sustainable acacia wood in dark slate grey finish, this sturdy furniture comes with beige all weather-seat and back cushions. 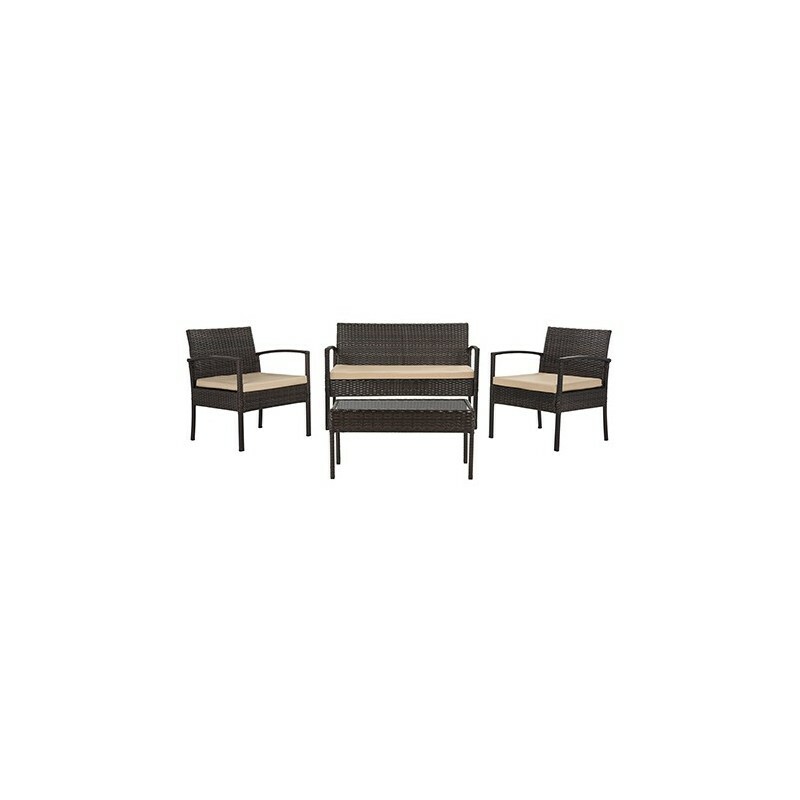 Designed for lingering conversation under the sun or stars, the Anaheim 5-piece coffee set is masterfully crafted with a crosshatch seat backs and slatted table in sustainable acacia wood with teak finish. Relax in style on beige all-weather cushions. 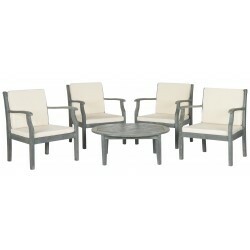 Designed for lingering conversation under the sun or stars, the Anaheim 5-piece coffee set is masterfully crafted with a crosshatch seat backs and slatted table in sustainable ash grey finished acacia wood. Relax in style on beige all-weather cushions. 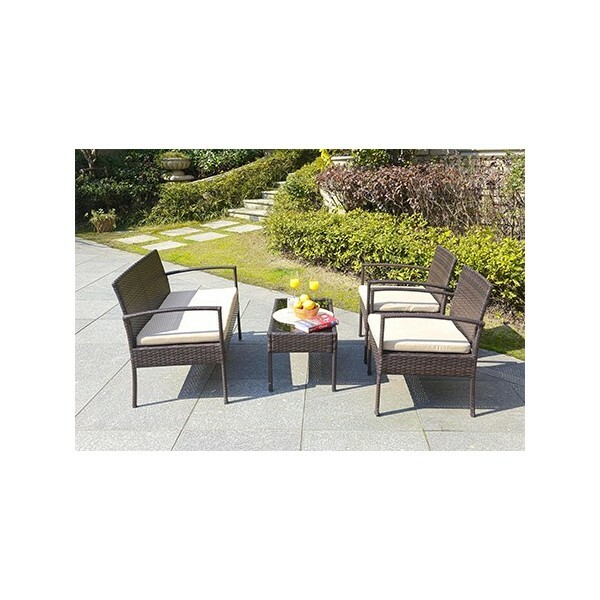 Designed for lingering conversation under the sun or stars, the Anaheim 5-piece coffee set is masterfully crafted with a crosshatch seat backs and slatted table in sustainable dark slate grey finished acacia wood. Relax in style on beige all-weather cushions. Relax and unwind in elegant style with the beautiful Colfax 5-piece coffee set. Luxuriate in deep armchairs of sustainable acacia wood in teak brown with beige all-weather back and seat cushions. Artful details define the coffee table and seat backs. Relax and unwind in elegant style with the beautiful Colfax 5-piece coffee set. 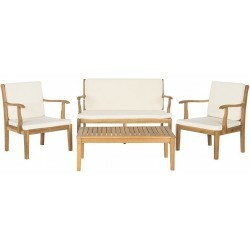 Luxuriate in deep armchairs of sustainable acacia wood in ash grey with beige all-weather back and seat cushions. Artful detailing defines the coffee table and seat backs. Add contemporary flair to your patio or deck with the Bradbury 5-piece dining set in sustainable acacia wood with classic teak brown finish. Comfortable arm chairs with beige all-weather cushions boast tasteful crosshatch backs for luxe outdoor dining. 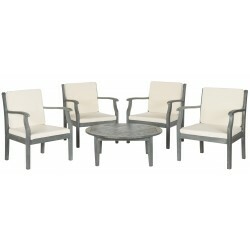 Add contemporary flair to your patio or deck with the Bradbury 5-piece dining set in sustainable acacia wood with classic ash grey finish. 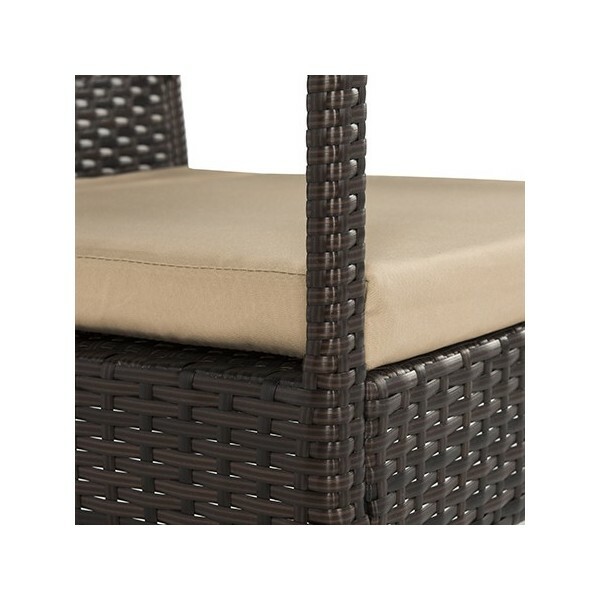 Comfortable arm chairs with beige all-weather cushions boast tasteful crosshatch backs for luxe outdoor dining.